May 2014 – Tools for strategic and strong-minded thinkers! As a strategic thinking coach, I help people become more competent in the art of thinking strategically. Since strategic thinking, by definition, is concerned with success, I need to provide some sort of target for competency. That is the purpose of this article. Organizations with good strategy thrive; we are in an age of exploding complexity and this complexity creates threats and opportunities. The purpose of strategic thinking is to create good strategy; thus, organizational success is directly tied to success. I remind you that strategic thinking is a style of thinking, practiced by the individual. Strategic thinking is not a set of process or a part of a process (some people mistakenly confuse it for environmental scanning) or a tool (some people mistakenly confuse it for SWOT or scenarios); although those processes and tools can enhance the practice of thinking strategically. they naturally and intuitively think strategically. The person is continually thinking about how he or she defines success. The person generally curious. As part of this curiosity, he or she is alert for patterns and see patterns and systems effects. He or she is alert for opportunities. The person recognizes inertia; that is, the state of affairs when there is little change and other are habitually following the status quo. In this case, the strategic thinker might encourage change (of a low-grade variety) simply to break the routine. I recently heard of a team of executives who decided to read magazines from outside their industry and field of expertise. The person recognizes when compartmentalization of functions and specialties in an organization are causing too-narrow of a view of the organization. The person is more aware of strategic resources in their possession. What does the improvement pathway look like? Two of the most important functions of a coach are to removing misconceptions and change inappropriate habits. These misconceptions and habits are different with each individual. Thus, in the diagnostic phase of coaching, we need to find out what the person knows that is true and what they know (and do) that is unhelpful. It’s not what we don’t know that causes trouble. It’s what we know that ain’t so. Thus, it’s better to tailor coaching to the existing knowledge of the learner. All learners have strengths, and it is helpful to use them as foundation. For example, skill in risk analysis can be leveraged because risk analysis is a process of understanding cause and effect with the recognition that the effects appear in the future. A person who is competent at risk probably is comfortable with systems thinking and imaging the future, which are traits that are useful for strategic thinking. Undoubtedly, individuals can pursue a self-directed course of study to improve their competency in strategic thinking. I encourage all learners of strategic thinking to study examples. Movies are a good choice that can be fun as well as instructive. The movie that best portrays strategic thinking is Moneyball, but other good choices are 42, The Social Network, Dirty Rotten Scoundrels, and A Beautiful Mind. You can find plenty of examples from historical and fictional characters, too. 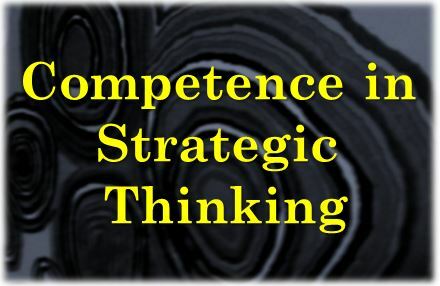 Do you agree with these characteristics of competent strategic thinkers? What else should be added?